The team at the Tasmanian Writers’ Centre was shocked and hugely saddened to hear about the death of local writer and photographer Brett Martin last week. Brett was a former member of the TWC Board, including a spell as chair in 2008 and deputy chair in 2009. Before moving to Tasmanian and taking up a role as librarian with the State Library of Tasmania from 2003, Brett previously worked at Wagga Wagga City Library in NSW. He published two novels and was actively involved in the arts in Canberra, throughout regional NSW and in Tasmania. He also served on several editorial committees as well as tutoring at Charles Sturt University. 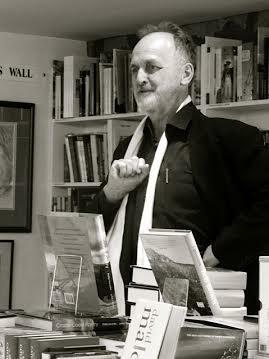 Brett’s best known book was Marion, which launched at the Hobart Bookshop in 2014. The book and accompanying website reflects on the life of Marion Oak Sticht. Marion was born in 1865, grew up in Colorado, was educated at Vassar and travelled widely in Europe. She married the American metallurgist Robert Sticht in 1895 and they set out almost immediately for a mine on the remote west coast of Tasmania. Robert Sticht carved an international reputation and amassed a world-class collection of rare books and fine art prints, all housed in Penghana, their magnificent house on the hill in Queenstown. But a calamitous investment trapped the Stichts in debt and they were unable to return to the USA. After Robert died in 1922 Marion was forced to retreat to the ghost-town of Balfour, exchanging the grand house with its many staff, for a bare-walled wooden shack. The trajectory of her life is tragic and largely unknown. Marion is representative of a class of well-educated, middle-class women of those times, whose stories are usually lost in the shadows cast by their husbands. Brett’s novel based on her life seeks to bring her into the light. In 2014, Brett was an adviser on the Looking for Marion exhibition, which took place at the 2014 Queenstown Heritage Arts Festival. In addition to his writing and research, Brett was a talented photographer. and has had a number of photographic exhibitions across the State. You can see details of his most recent at the Devonport Gallery here, and of his 2011 exhibition at Ritche’s Mill here. Brett Martin will be hugely missed, and the team at TWC wishes to send its deepest condolences to his family and close friends. There will be a celebration of Brett’s life in Swansea on April 22nd: a Concert at The Court House at 2.30pm, followed by a wake.